"Your site is so informative. I love it!" What's a great thing to do in the fall? Apple picking in New Hampshire!! 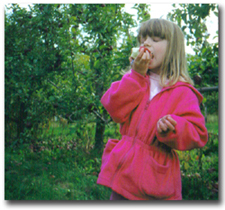 The Lake Winnipesaukee region has several farms and orchards where you can pick your own apples. It's fun to take the kids too. Most of the farms will offer free wagon/hay rides to get to the apple orchard. This is fun and also great for the ride back when you have a heavy bag of apples! All of the orchards have different varieties of apples to pick. 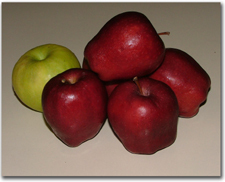 The most popular in the northeast are McIntosh They're great for making applesauce and just plain, old eating. 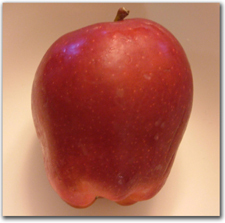 Cortland apples are great for baking pies. Mmmm! The fun thing about picking your own apples is eating them as you pick. There's nothing tastier than a fresh picked apple. How do you pick apples? The workers at the farm stand will tell you how to pick apples. In case they're busy, this is how. You grasp the apple and twist it gently so the apple and stem come off. It's that easy! Many of the farms also offer cider, pumpkins and other related products. There are quite a few apple orchards and farms for the whole family to enjoy going to. So remember that mid to late September and part of October is the best time for apple picking in New Hampshire.